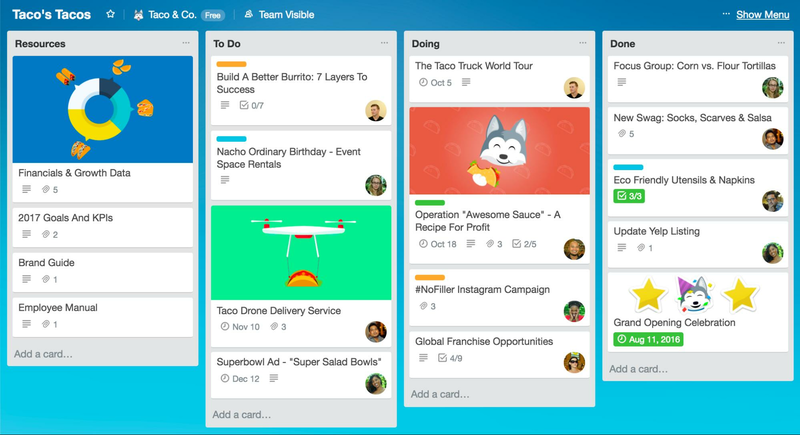 Work smarter with your very own Trello board. #TrelloTips: Check out our Inspiration page and Team Playbooks for board workflow ideas and examples. Click "Add a list" to add your first list to your board, such as "To Do." List names can be as simple as steps like “To Do,” “Doing,” and “Done” or as detailed as needed for the work you are doing. Add as many lists to your board as you need to build out a workflow. #TrelloTips: Experiment with additional lists on your board, or for using lists as repositories to hold information. Trello is infinitely flexible, so you can customize lists to the workflow that fits your team best. Add cards for each task that needs to be completed by clicking “Add A Card” in the first list. Keep card titles short to make it easier to scan and see the status of each card on the board. #TrelloTips: Easily add cards to a board in bulk from a list or spreadsheet by copying the list and pasting it into a new Trello card. Trello will automatically turn each line-separated item into a new card, and you can kiss those old tools goodbye. Invite members to your board so that they can be assigned to tasks and collaborate on your board. Click “Invite” in the board’s menu and select members of your team to add to your board, or invite members by their email address or name. Get an easy-to-share invite link to your board at the bottom of the Invite menu. Drop the special link in a chat room or email and anyone with the link will be able to join your board and start collaborating. 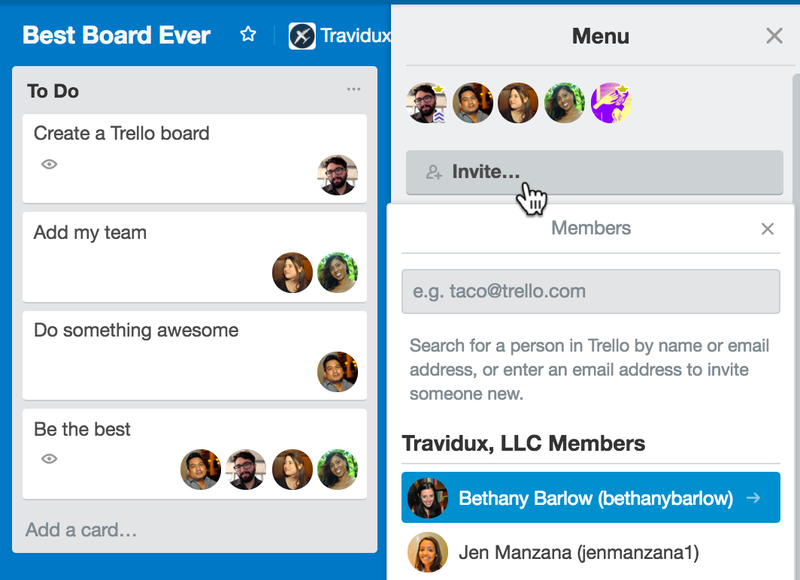 #TrelloTips:Add members to cards by dragging their avatar from the Members section of the menu onto Trello cards so that everyone knows what to do when they open the board.  Change the visibility of a board by clicking the current visibility status to the right of a board’s name. 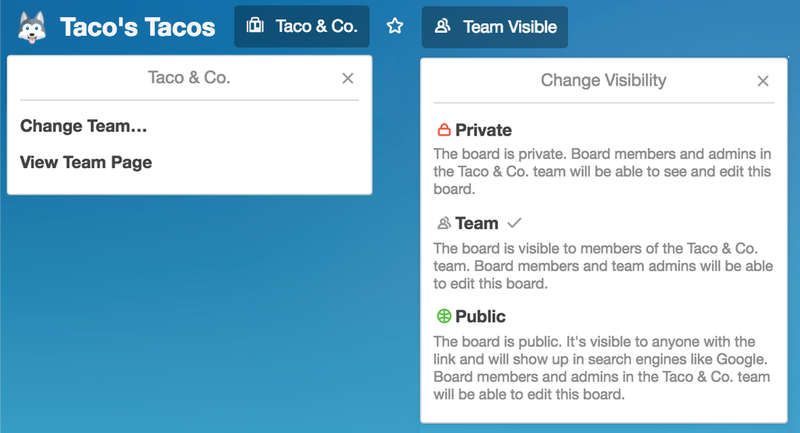 Boards in teams make it easier for everyone you work with to collaborate together. For boards that shouldn’t be in a team at all, click the team name, then "Change Team," and set the board’s team to None. Way to go! Your first board is all setup and ready for action.